The Hawaiian Registry Program (HRP) is the branch of the Office of Hawaiian Affairs (OHA) which handles Native Hawaiian ancestry verification. Once an individual’s ancestry is verified, HRP will issue a Hawaiian Registry card as proof of being verified as Native Hawaiian in accordance to our verification procedures. HRP strives to verify Hawaiian ancestry through biological parentage. No blood quantum is required. 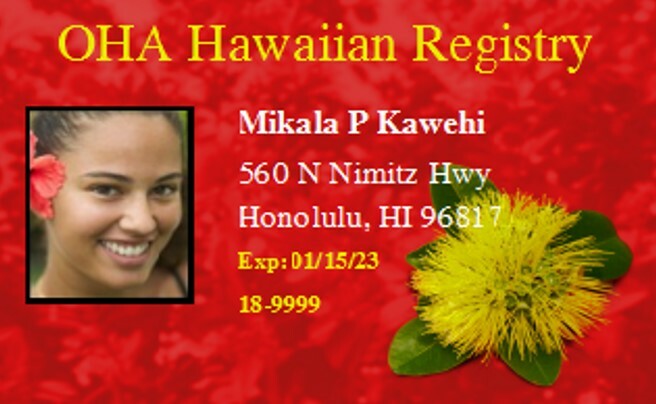 The Hawaiian Registry card confirms your Hawaiian ancestry for OHA’s purposes. The card comes with a variety of benefits which includes eligibility to OHA Programs such as OHA loans and grants, and eligibility to OHA-sponsored programs such as OHA-funded scholarships. * Ancestry verification cards must be renewed every 5 years. Call HRP at (808) 594-1914 or email at hireg@oha.org to have a form mailed to you. Please provide your name, address, and how many forms you need. Or visit any OHA office. Completed and signed application form for each applicant: If applicant is a minor, a parent or legal guardian must sign the form. When a legal guardian signs the form, guardianship documents must be submitted. Birth certificate(s) for the applicant, parent, grandparent and so on as needed to reach a birth certificate that reflects Hawaiian ancestry. State or government issued photo ID such as a driver license, state ID, or passport of the applicant. If a minor applicant does not have a photo ID, the photo ID of the parent or legal guardian who signed the Hawaiian Registry Form is required. A picture of the applicant to be used on the Hawaiian Registry card. Pictures can be submitted as photographs or digital images. Once the form and documents are received by HRP, we will begin the ancestry verification process. It usually takes 2-3 weeks for processing. * When submitting documents, please ensure the entire document is visible, legible, and has not been tampered with. Incomplete, or unclear documents as well as those in poor condition cannot be used. If you are renewing an expired Hawaiian Registry card, please submit a completed Hawaiian Registry Form and be sure to fill in the “Renewal” bubble toward the top of the form. All renewals are subject to review to ensure ancestry is verified under current ancestry verification requirements. Processing usually takes 2-3 weeks. While it may not always be necessary, it is recommended to resubmit the documentation required for ancestry verification when renewing a card. It is also advised to submit a new picture of the applicant so that a current photo is used on the new Hawaiian Registry card. The Hawaiian Registry Program is open weekdays from 8:30 a.m. to 3:30 p.m. on Oʻahu.